Bacterial cells commonly act as little machines in the lab of a bioresearcher. Some fluoresce as they bind to certain particles, others change color based on the presence of a certain chemical in solution. Useful as these cells are, they are generally pre-set; each lab has to find one that does the necessary job or wait for one to be discovered. Now the wait is over – thanks to a research team at the University of Michigan, Ann Arbor, where programmable bacterial cells are quickly becoming a reality. The implications of programmable cells are incredibly large. For instance, one could program a cell to turn purple in the presence of quicksilver or seek out cancer cells. "Our project breaks new ground," says Drew Dunham (left), one of the researchers on the Michigan Synthetic Biology Team. "Scientists can program the bacteria to use signals in their environment as inputs and express different outputs depending on that input," he elaborates in a recent news release. This means that a given lab can customize their own type of cell to do exactly the job they need. Perhaps the most impressive aspect of the programmable cell project is the demographic of the researchers themselves. 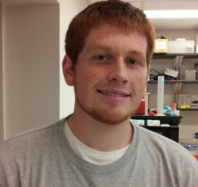 For instance, Drew Dunham is an undergraduate studying microbiology. 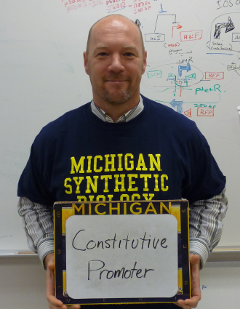 The Michigan Synthetic Biology Team is entirely made up of undergraduates and is led by Marc Ammerlaan (right) of the Department of Molecular, Cellular, and Developmental Biology. But Ammerlaan is quick to remind that "I don't tell them the science. I drive the car and they do all the work.” The students have qualified for the International Genetically Engineered Machine Competition at MIT twice now, and Ammarlaan believes it’s only a matter of time until they take the gold medal there. In addition to advancing research technologies, the MSBT works to spread the word about synthetic biology and dissipate some of the negative stigma that so often comes with biotechnological pursuits. To that end, they have developed an excellent educational video game that follows the life of a plasmid through DNA splicing and recombining. It’s a fairly addicting game that explains the process very well.